Imagine a plain whiskey bottle held loosely by a gun toting, grizzled, nameless man with eyes shaded by a weather worn hat. He tips the bottle up and takes a burning drink as he contemplates the sales in … Bygones. 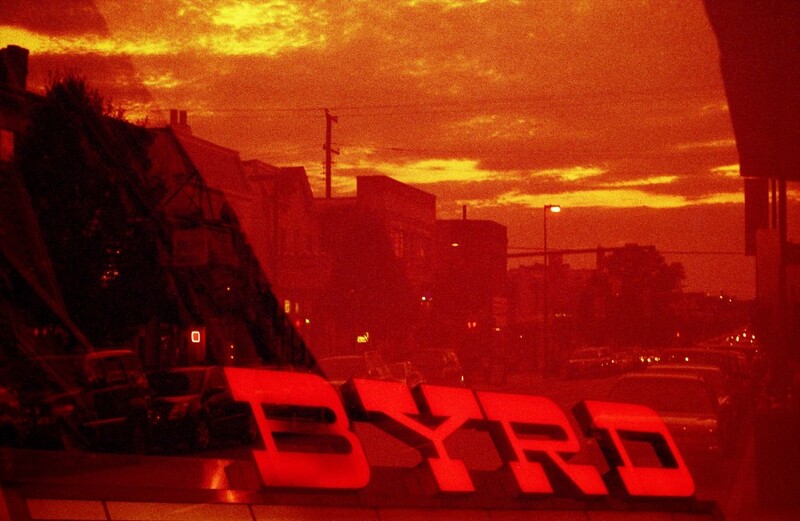 Maybe it’s the font of the Byrd sign coupled with the parapet walls along Cary St. and the relentlessly red/yellow hues that make me see tumbleweeds rolling into view. This has been shot on red-scale film – a technique found by accident in a time when color film had just come on the scene. The photographer would load the film into the camera but load it backwards making the back of the film the first thing to see the flash of light from the shutter. This is the red spectrum’s domain and will react to light sooner than the green and blue spectrums. So what you see is almost purely red and yellow hues. This picture is best enjoyed with a smokey whiskey and a steak bomb from Coppola’s.